San Francisco has become the location of a storm that is brewing in the midst of a lively urban social scene. Many residents and Bar-goers may become familiar with long 22 foot waxed tables we call shuffleboards in the coming months as many enthusiasts have remarked that the time is right. Although the shuffleboard has been most popular in Texas and Oklahoma, many are confident that the tides are beginning to turn with organized events like Heineken’s traveling shuffleboard tournament. This year, organizers brought the fun and games to several sold out bars in the city of Atlanta to a surprising turn out. Shuffleboard became popular in the early 1940’s but interest began to wane in the 90’s. Yet and still, this short lived movement was able to raise a powerful and dedicated following of players who would attest to the games attraction. Fast forward to the new millennium, an aging generation of experienced shuffleboard players have noted the dire need of skilled players who are in their youth. Enter San Francisco’s Shuffleboard Renaissance. The advent of the Shuffleboard has been debated. 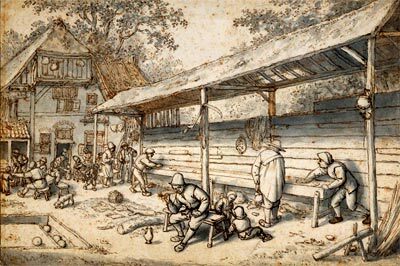 Some say it dates back to the 1500’s! Image via Ziegler World. There is interest in the 415 area code but it is difficult to find a good spot to call your “home bar.” This is because of simple economics; real estate costs space and bar owners would rather maximize their earning potential with dining tables than give up valuable floor space for a game table. James O’Brien and others who share his passion are hoping to change this. Other like James are taking action to spur a new generation of shuffleboard players that will revive the community with an urban Renaissance of sorts. In fact, several local bars have been receptive to requests to incorporate full-size tables. Among them are Wild Hare, a hipster bar located in Pacific Heights. El Rio and Doc’s Clock are also considering upgrading to regulation size tables to encourage a competitive environment. But what’s a good ole’ game of shuffleboard without a wager? Many insist that a little gamble is a key ingredient to formulating a good shuffleboard scene. In fact, most professional competitors will admit that they enjoy the competition and the prize money that comes along with the ultimate trophy of all; bragging rights! Many casual players note that a friendly wager can always make things interesting. 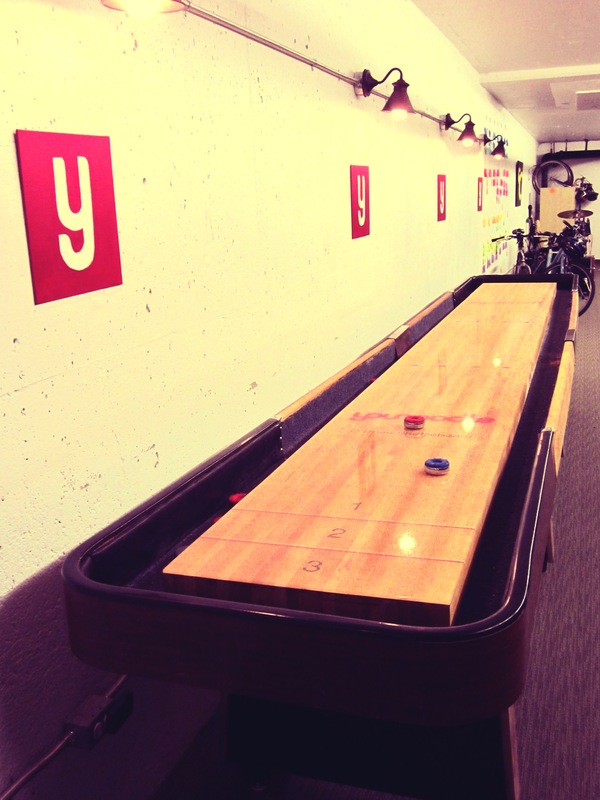 Company employees enjoy a game of Shuffleboard at YouNoodle headquarters! Image via O’brien Shuffleboards. Shuffleboard has been adopted by some of the most successful businesses with exceptional company culture. Acceptance of shuffleboard on a grand scale may not be far off in the future. Aside from the social benefits, many businesses have realized that shuffleboard can actually improve productivity in the workplace. 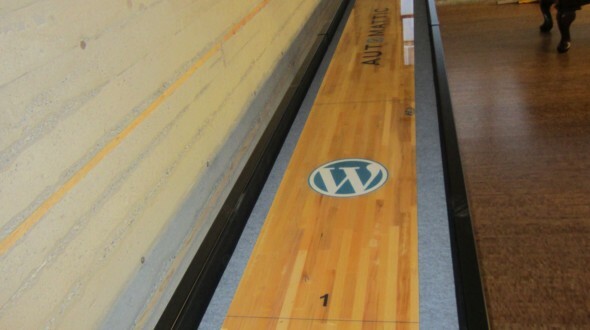 A Shuffleboard Table with the WordPress logo at Automattic! Image via Gr8 Creative. So what’s next? Many believe that a revival of shuffleboard is in the midst of hatching. With players ranging from young to old, shuffleboard is a game that can be played by anyone and shared by those with various socio-economic backgrounds and professions. The game is captivating, exciting, and naturally alluring. It’s one of those games that once you start playing, it’s hard to stop. James O’Brien and other shuffleboard players are hoping that many of those spectating on the sidelines will hop up and accept the challenge. Relatively easy to learn, shuffleboard is a great way to interact with others while enjoying the beverage of your choice! Cheers to shuffleboard! 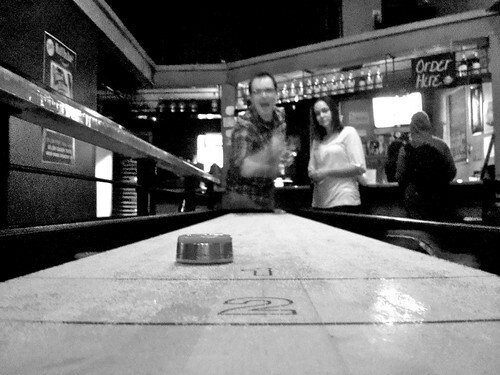 This entry was posted in Place to Play Shuffleboard by admin. Bookmark the permalink.